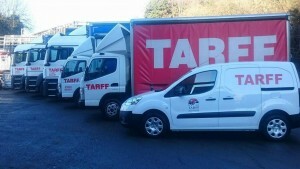 Tarff has a fleet of vehicles ranging from small delivery vans to rigid lorries and everything in between! Throughout our trading area, we can deliver most products although these are subject to terms and conditions. Deliveries range from bulk, tipped or blown as well as tote and 25kg bags. We can even arrange specialist products and order them in for you, we like to accommodate everyone!